Yesterday evening I was visiting my friend who was kindly giving me dinner after a nice day with my son and his family. My eyes started swelling. I ended up cutting the evening off to go home early and get antihistamines. As of this morning, the swelling was mostly gone but not entirely. I live with allergies. I am allergic to a whole bunch of things. Cherries and relatives of cherries are top of the list. The tiniest trace of cherries is enough to require a dash to the hospital. There are a bunch of other things like penicillin, certain molds, sulfites, certain perfumes especially anything with jasmine, and tree pollen. Normally I can keep this whole allergy thing under control by a combination of antihistamines and avoidance of triggers. This attack meant I broke several of my own rules. I ate stuff without careful washing. I love mango. It’s one of those wonderful spicy sweet things that makes life worth living. However I have to be careful with fresh fruits. I can’t eat them unless they are carefully washed. I bought some mangos on sale and they were so tasty. I should have carefully washed the mangos with warm soapy water, and rinsed them very well before peeling and eating them. I skipped the thorough wash step and just gave the mango a quick rinse because I was running behind to drive to the visit with my family. Produce often has all kinds of stuff on it. You don’t know who has touched that fruit, what they had on their hands, or what other fruits have brushed against each other. It’s fresh cherry season so I should be assuming my mangos have shared a bin with cherries and washed them as if I knew they had. I didn’t. I used strange floral natural stuff on my skin. My son and his family rented a cabin at a nearby resort and I visited them and went for a swim. They had this wonderful orange scented natural soap for rinsing off. It was heavenly stuff but I should have known better. Any fancy scented shampoo or other body product likely contains a blend of hundreds if not thousands of scents and perfumes. It is almost a guarantee that if I use one of those I will have allergy issues. At home I use only the simplest single ingredient product I can find. For example I use only apple cider vinegar as my hair rinse. I don’t even use products that are “hypoallergenic” like Ivory soap because such products contain “parfum” and that is a no no for me. I make all my own cleaning products using the plainest ingredients only. So I cheated for those delightful few moments and now I pay for it. I was around scented people in a heavily scented place. I used to make a big effort to raise consciousness about scent allergies and try to get people to not dose themselves with air poisoners. I have given up. People without allergies are just too addicted to their allergy inducing products and can’t be retrained. Besides, given all the pleasure people get from nice scents, who am I, the minority person with allergies to try to deny them their pleasure for my comfort? Better I pop pills and limit exposure. The resort was full of happy perfume and cologne scented people in the crowded hallways and washrooms and seating areas. The resort itself obviously uses tons of scented products on their sheets, cleaning products, and is probably releasing tons of scented stuff into the air. It’s a posh place and with posh comes scent. Normally I avoid going into hotels and resorts and other places with large public gatherings because of the whole heavy dose of scent thing. I even avoid the laundry aisle in the grocery store. People think I prefer to use my travel trailer instead of hotels or their guest rooms. That’s not it. My travel trailer is scent free and therefore safe for me. I would love to stay in your guest room but chances are you wash the sheets in floral soap and use a scented product in your dryer and so I’m better off in my trailer. I hate having you make a fuss and you’d probably miss something if you did anyway. I made an exception so I could be with my family and I paid the price. I drank some red wine without checking the bottle. My daughter-in-law comes from a culture where serving food and drink is how you show your love and respect. So naturally she poured me a nice half glass of red wine. I didn’t want to make a fuss and insist on checking the bottle. A lot of really nice red wines contain natural sulphites and for some reason those don’t bother me. But many wines have additional sulphites added as a preservative and sweetener and invariably those do bother me. For me, some allergies are trace things but many allergies require a dose effect, meaning if I get even the tiniest amount of cherry I get in trouble but a little bit of sulphites are okay. So natural sulphites in wine don’t affect me but if a wine has additional sulphite added, I do pay. I should have insisted on checking the bottle for added sulphites before enjoying that lovely wine. I always insist on beer in a bottle or can instead of draft “on tap”. Draft beer “on tap” often contains additional sulphites. I have no idea if that wine had sulphites. I didn’t check. I ate stuff with “natural flavour” in it. Natural flavour is a catch all term that can mean anything. Natural flavour can even change between one batch of something and another. So I can eat something with natural flavour in one package and then another package, same manufacturer but different date, causes me to react. The manufacturer can’t get enough of one natural flavour and they substitute another one and bingo, I get sick. Normally I never eat anything with natural flavour. But those candies were so nice! I cheated and I paid the price. I handled a package of cherries and then touched my face. 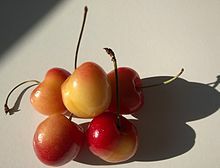 I am severely allergic to cherries but even though I can’t eat them, I remember how delicious they are. Rather than see a package of cherries get thrown out I chose to deliver them to someone who would eat them. That would have been okay if I had thoroughly washed my hands after handing them off and until then avoided touching my face. I didn’t, so I pay the price. If I had just had the wine, or just ate those things with natural flavour or just used the fancy scented shampoo, I probably could have gotten away with it. But I was having a good time and enjoying my family and well…I just didn’t pay attention. I hit my body with too many things too fast and the cumulative effect was likely too much. I did stuff while already stressed. My husband is out of town and I always feel stressed when he’s not around. I worry about stuff I don’t normally and I have to deal with things he normally handles. When I am already feeling stressed I tend to be more reactive. It’s like stress throws my immune system into hunt mode and then I react to stuff it usually ignores. I took chances while I was already hyper-reactive. A few weeks back I got a bad dose of poison ivy. It has all healed up but as is so often the case, I am left feeling highly reactive for a few weeks after a bad attack. It’s like my immune system is still cranky from lack of sleep and ready to throw a temper tantrum at the slightest thing that normally it would ignore. I have noticed that I also tend to be more reactive when it is tree pollen season. So someone I work with can wear a scent all winter and it never bothers me and then May arrives and I am all swollen and wheezy. They think I am making things up because suddenly the same scent I was fine with all winter is now a problem. I’m not. It’s just the load thing. I can handle the scent or the pollen but not both. It could be that just because I was in a hyper-reactive state, the whole stupid overload chance I took was just post bad attack crankiness and no one thing was responsible. I was already showing some symptoms of impending allergy trouble but I didn’t have my meds with me. This was a real mistake on my part. I often can feel an allergy attack coming on with prickling in my eyes, a sensation of tightness in my chest and feeling like I am going to get a headache. If I am careful and take an antihistamine and an anti-inflammatory like ibuprophen, I ran cut one of these attacks off before they get bad. I didn’t have the stuff with me at the resort because I forgot to refresh my supply after the last time. That cost me. I have no one to blame but myself. I read somewhere that people with allergies are often neurotic. It’s not being neurotic that makes you have allergies. It’s dealing with allergies that makes you neurotic because you have to live with hard to define limits that change like “being in a highly reactive state” or the load thing. Today I am taking a day off and resting and recovering. I am diligently washing my hands and taking my meds and using a cold pack on my swollen eye. By tomorrow I should be feeling better. I wish science knew why some of us have paranoid immune systems subject to occasional psychotic breaks like I do. Science doesn’t and so I just have to live with it. This is mostly my own fault because I didn’t follow my own rules and I didn’t have my meds along. I just really get sick of having to put up with this nonsense some days. And besides, the visit with my family was more than worth it. I just can’t do it all that often. This entry was posted in Tumbleweeds Tumbling and tagged allergic reactions, allergies, health, scent allergy on July 26, 2018 by tumbleweedstumbling. We are not a bird watchers per se but we do love a good birding event since it gives us a chance to do some naturalist stuff which we really do enjoy, no matter the species. This trip was almost as rewarding for us as the turtle rescue event with a lot less stress. Our trip was organized by IBA Canada IBA meaning Important Birding Area. When we found out they could use volunteers we jumped at the chance. And I am so glad we did! We met at 7:00am at our neighbour’s house. Harry Harris is the retired former Conservation Officer for our rural municipality (county in American) and he’s an avid birdwatcher. We were divided into groups so we could each cover an area. Our objective was to survey the area and find as many red headed woodpecker pairs as we could. We were armed with binoculars, and a recording of the territorial drumming and squawking they make to be sent out via a loud speaker. Our area included the town of Alonsa. And off we went. We drove up and down backroads in Alonsa I didn’t even know existed. That included one long stretch with grass that reached up to the hood of my truck. We were searching for the favourite habitat of these gorgeous birds. They like grazed grass below a stand of mature trees that also includes a few dead ones. They especially like the dead aspen that is soft and normally full of delicious bugs. We had success at our third stop. The woodpecker is highly territorial and apparently not very discerning because playing that call brought the males right to us, bristling with hostility and drumming and squawking at us as if we were mortal enemies to be frightened off. They would pause a short distance away and glare at us trying to figure out what was going on. Obviously we were not male woodpeckers but we sure sounded like them. We would confirm them by sound and by sight. If we got a male doing the territorial thing, we assumed there was a female nearby even if we didn’t actually see her. The local farmers, being both inquisitive and watchful, drove by to check us out and one stopped to chat. Once they knew we were bird watchers, and not castle rustlers, they relaxed and had a good laugh. The cattle also found our antics quite fascinating. And so it went, driving from place to place, running the recording, waiting for a response and then making careful notes with the GPS on the exact location of a pair. We saw lots of other birds as well. It was fun being with real birders who could spot a little nondescript brown bird and actually know the difference between Chipping, Vesper and Savannah sparrows. My favourite “other” bird that we saw was this darling fledgling American Kestrel. The baby bird stayed very quiet, clinging to the tree while we snapped a few pictures. Unfortunately the camera can’t distinguish the way the eye can so the picture ended up showing only the silhouette. We also saw a family of sharp tailed grouse and fledgling sand hill cranes. We are so lucky to live in such a fine birding area. Bird life positively teems here and we found a new appreciation for our beloved home. After driving about for several hours we joined all the other birders at Hollywood Beach for lunch. This location resulted in an impromptu shore bird count session. I learned there is a difference between a Caspian and a Black Tern and there are at least five different kinds of sandpipers. I must admit I was more interested in watching the bird watchers than watching the shore birds. The shore birds kind of all look alike to me but enthusiastic excited people are fascinating and uplifting to be around. It was overall a great day and we plan on attending several more of their bird counts and birding events as summer progresses. If you are the kind fascinated by bird watching species details you can check out all the different species at the IBA website. This entry was posted in Tumbleweeds Tumbling and tagged bird watching, Manitoba, naturalists, red headed woodpeckers on July 24, 2018 by tumbleweedstumbling.